It’s hard to believe, but Samsung is now on its 10th iteration of the Galaxy S line of phones. The Galaxy S started a wave of success for Samsung that continued on in its various iterations over the years. Today, in a slight change of pace, Samsung is holding the launch event of the new Galaxy S10 out in San Francisco – a few days earlier than the usual Barcelona/MWC unveiling. At the heart of all Galaxy S10 variants, we find brand new generation SoCs, driving the core features of the new phones: The Qualcomm Snapdragon 855 and the new Samsung S.LSI Exynos 9820. The SoC determines not only the performance of a phone, but also dictates features such as the camera specification (camera count, resolution, and recording quality). Most importantly, power efficiency is the one metric which can be immensely impacted by a SoC. Being such an important component, it’s still very odd to see Samsung Electronics insist its tradition of dual-sourcing this part from multiple vendors. Users in the Americas, including the US, China, and Japan will be seeing the new Galaxy S10 phones powered by Qualcomm’s new Snapdragon 855 SoC. We’ve had the pleasure and opportunity to cover the new chipset in quite a lot of detail, including a full performance preview of the new silicon. The new Qualcomm chip sports new generation CPUs derived from Arm’s Cortex A76 CPUs – one at a maximum frequency of 2.84GHz with three further cores at 2.42GHz. Alongside the performance cores, we again see four Cortex A55 derived cores at 1.8GHz serving as the efficient workhorses of the system. The new Snapdragon chip showcased excellent performance, however the aspect which impressed the most is the much better power efficiency on both CPU cores as well as the new Adreno 640 GPU. The new 7nm chipset thus promises to deliver top-tier battery life in the devices that it’s integrated in. Users in the rest of the world, including markets such as Europe, Korea, Australia and other EMEA markets will be seeing the adoption of Samsung’s own Exynos 9820. The chip is the successor to last year’s less than impressive Exynos 9810, which had troubles competing with Qualcomm’s Snapdragon 845 both in performance as well as power efficiency. We don’t know too much about how the new Exynos will perform – we do know that it will be employing a new tri-cluster CPU configuration, with two new M4 cores at 2.73GHz, two Cortex A75 cores at 2.31GHz and four Cortex A55 cores at 1.95GHz. The CPUs are partnered by a new Mali G76MP12 GPU. It’s also to be noted that the Exynos 9820 is manufactured on an 8nm 8LPP process, which in theory should be inferior to TSMC’s 7nm process – although we’ll have to wait to see how the actual results end up. An important aspect of both SoCs that are represented in the features of the new Galaxy S10 is the new NPUs – or neural processing units. Essentially the new dedicated machine inferencing hardware will be able to accelerate workloads, enabling some of the new camera features which we’ll see today on the S10. Continuing on with the internal specifications, all the Galaxy S10’s start with base DRAM configurations of 8GB, with the exception of the S10e, which start off at 6GB but then also gets 8GB in its higher tier model. The new Galaxy S10+ even comes with a super-premium 12GB variant. A big kudos to Samsung this year is the fact that all the models are starting with a base 128GB of storage capacity, doubling the storage compared to last year’s Galaxy S9. The Galaxy S10e’s higher tier variant allows for a bump to 256GB of storage, with the Galaxy S10 and S10+ jump directly to 512GB. Again, the S10+ offers a super-high tier which a whopping 1TB of internal storage, which leave even the most avid 4K video recording fans satisfied – if you’re willing to pay the price difference. Other internal aspects of the phones is the larger battery capacities. Here Samsung was able to increase the battery capacity of the S10 and S10+ by respectively 13 and 17% compared to the predecessor S9 and S9+. In absolute values, that’s 3400mAh for the S10 and 4100mAh for the S10+. The great things about the new models is that Samsung has managed to increase the battery capacity not only while maintain their form-factors, but actually while reducing the thickness of the new phones, and also making them lighter. The new lower-tier Galaxy S10e comes with a 3100mAh capacity battery, which by itself also represents a bigger part than last year’s Galaxy S9. 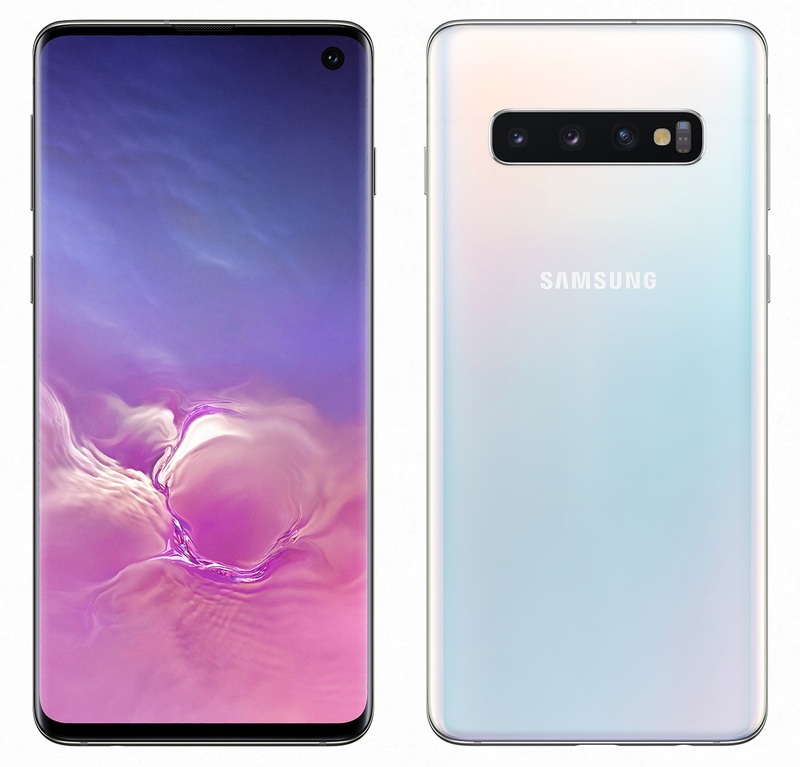 Design is the big hyped about change about the new Galaxy S10’s – and front and centre of the new design is Samsung’s new display. On the Galaxy S10 and S10+, we see a similar curved edge design that we’ve become accustomed to in the S8 and S9 series. The difference here is that the new phone sheds a lot of the bezels at the top and bottom. 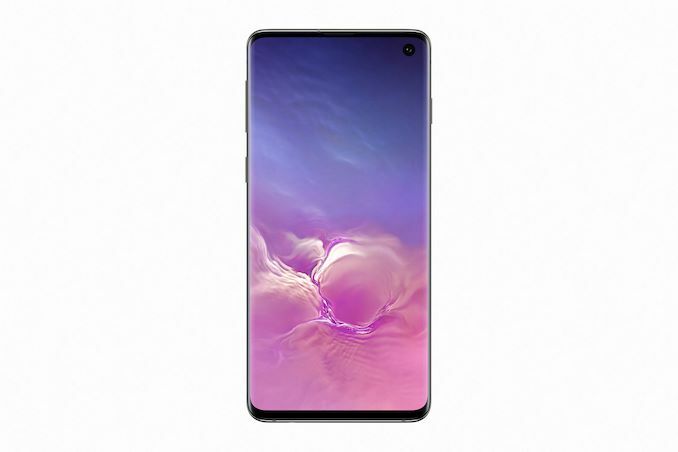 Samsung had unveiled the “Infinity-O” design back last November, and the new Galaxy S10’s are the first OLED screen phones from the company to employ the new characteristic. The new minimalistic bezels look great, and the S10e and S10 both sport their front-facing cameras in the upper right corner of the screen with this new hole-punch design. I’ve actually had quite a bit of time with a competitor product with a similar design: Honor’s View 20 – the only difference here is that Honor opted to put the camera on the top left corner. Actually, I do think Honor’s approach made a bit more sense than Samsung’s, as the latter’s implementation means the status icons and clock will be permanently shifted to the left, while I don’t find having the notification icons shifted to the right to be all that bothersome. The Galaxy S10+ actually accentuates this aspect, as the phone adds in an additional front-camera, creating a pill-like cutout instead of a more simplistic circular hole cut-out, which further shifts the clock and notification icons left. Talking about the new front camera modules themselves, the main sensor is a new 10MP unit with an f/1.9 aperture, for the first time allowing front-facing 4K video recording. The Galaxy S10+ adds in an additional 8MP f/2.2 module whose sensor is a dual-pixel PDAF unit, enabling Samsung’s “life focus” feature which we’ll cover shortly. Going back to the screen specification, the new Galaxy S10e comes with a 5.8” diameter display, while the S10 and S10+ come in at 6.1 and 6.3 inches. The large screen sizes shouldn’t alarm you, as Samsung has further elongated the display aspect ratio to 19:9. What really matters is the actual width of the phones, and in this regard the S10 and S10+ match the dimensions of the S9 and S9+. The new member of the family, the new S10e actually comes in a slightly smaller form-factor than the S10. Where the S10e also further diverges is that it actually has a flat screen, avoiding the curved edges of its siblings and predecessors. Furthermore the front glass is of a Gorilla Glass 5 type, whereas the S10 and S10+ employ Gorilla Glass 6. Lastly, the screen resolution of the S10e is only 1080p (2280x1080), while the bigger phones come with Samsung’s usual 1440p (3040x1440) panels. Two new features sharing among the new panels is the inclusion of HDR10+ compatibility. Here Samsung has seeming for the first time included a 10-bit panel in the new S10 units. 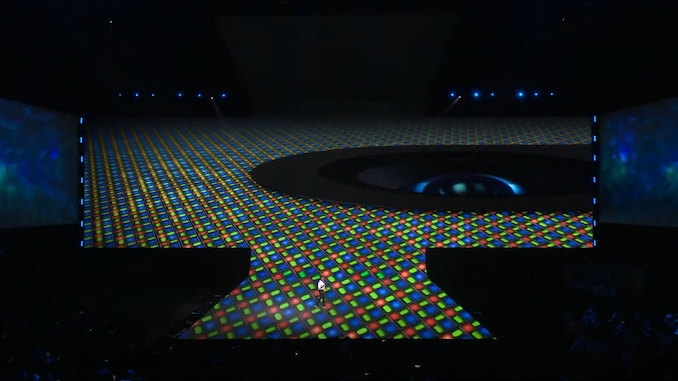 To enable HDR10+, the panels also have to become bright, and again here Samsung ups the specification by delivering 1200nits peak brightness – an double over the 600 nits peak that we saw on the Galaxy S9. The fact that the new screen panel might be 10-bit gives me pause in terms of what this mean for power consumption. Samsung’s new DDIC will have to work that much harder with a lot more voltage levels to consider, and I’m very curious to see how this will play out not only in terms of panel efficiency, but also the critical matter of the new phone’s base power consumption. Turning the phones around, we find Samsung’s first ever triple-camera setup employed in a flagship. Dual-camera setups have become so “2017/2018” and new triple-camera setups are the new big thing. For the Galaxy S10s, it’s notable to mention that the triple cameras are just found on the S10 and S10+, while the S10e only comes with a measly dual-camera setup! The main camera sensor on all phones seems to be seemingly similar to what we’ve seen on the Galaxy S9 – a 12MP sensor with Dual Pixel PDAF and a dual-aperture lens system that can switch between f/1.5 and f/2.4, all housed in an OIS capable module. We currently don’t have more information on how and if the new sensor has improved, we’ll be updating things as we find out more. The other camera sensor that is present on all S10 modules is actually this year’s brand new unit: a new 16MP 123° wide angle lens module with an aperture of f/2.2. I’ve always been a big fan of wide-angle camera modules as I find they provide a lot more common usefulness than compared to telephoto modules. For the longest time, this was an exclusive feature of LG phones, and it’s only been last year when Huawei started employing triple-camera setups in the Mate 20 series that we finally saw a good alternative to LG’s implementations. I’m very much looking forward to see how the new S10’s wide camera unit will perform in actual usage, and if it’s going to be as good as say, the Mate 20 Pro’s. Finally, the telephoto lens again seems very similar in specification to what we’ve seen on last year’s S9+. This time around, Samsung has opted to maintain feature-parity between the S10 and S10+, which I find great, as you won’t have to feel as missing out if you prefer the smaller form-factor. The S10e naturally being a lower-end version, ditches the telephoto lens. It’s interesting to see Samsung had decided to drop the telephoto lens instead of the wide-angle. Besides market research and user preference, one reason I can think of is that the telephoto lens is just a more expensive component due to it featuring OIS – and thus it made more sense to drop this part compared to the possibly cheaper wide-angle module. 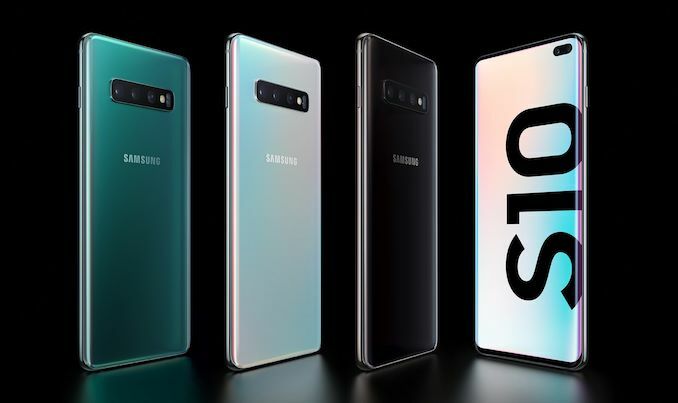 The Galaxy S10 and S10+ are the first commercially available phones which come with an ultrasonic under-display fingerprint scanner. Samsung last year opted not to go with the first generation optical-based sensors out of concern of accuracy and speed. The new solution is actually provided by Qualcomm – and promises to be able to not just to be more accurate, but also more secure, as it’s able to detect 3D features in your fingerprint ridges, something that an optical sensor wouldn’t be able to do. The S10e avoids this more expensive component, and instead features a side-mounted regular capacitive fingerprint scanner at the position of the power button. 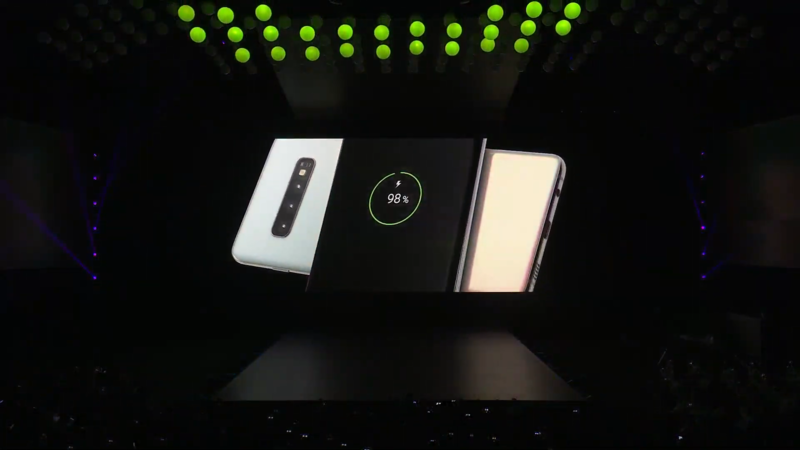 Among other new features of the S10 line-up is the introduction of reverse wireless charging. Here Samsung took note of Huawei’s implementation in the Mate 20 Pro and adopted it in its own flagships. Samsung’s feature actually has a direct use-case out of the box, Samsung also introduced new wireless earbuds which can be charged (with help of their storage housing) wirelessly by the new Galaxy S10’s. The new Galaxy S10’s are also the first phones to be able to support the new 802.11ax (Wifi 6) standard, thanks to integration of Broadcom’s new BCM4375 chipset. Software wise, the S10 launches with Samsung’s new OneUI. The new UI design actually isn’t exclusive and new to the S10 as we’ve seen it roll out over the last couple of weeks to the S9 and Note9 lineup. I’ve had some time with OneUI on the Note9 and I think this is Samsung most polished design to date – everything is clean and clear, and most importantly in terms of features it’s one of the best vendor implementations of Android out there. The new Galaxy S10’s will be available in the US starting March 8th and in Europe starting March 9th. The Galaxy S10e starts at $749€ for the 6GB/128GB variant, the Galaxy S10 is priced at $899€ for the 6/128 version while the higher end 8/512 variant comes at $1149€. Finally the Galaxy S10+ starts at 1009€ at 6/128, $1249€ for the 8/512 version, and finally a whopping $1599€ for the 12GB/1TB luxurious version. I don't use wired headphones often but the few times I instinctively wanted to plug one into the phone and realizing there is no port is annoying. I'll reward them with my wallet whoever puts a hf jack on their phones. This used to be the case, and most audiophiles would only use phones with external DAC/amps but for the last few years, most flagship phones now come with very acceptable internal DAC/amps that are close enough only the biggest snob of audiophiles would call them unusable. The headphone DAC market is probably slowly dying with the quality that phone and motherboard manufacturers are starting to bundle with their nicer products. The same DAC, capacitors, etc, as you find in relatively nice audio products included for a tiny premium built into your computers or phones.